To read part 1 and 2, visit www.TheHollywoodSentinel.com Archives section. This is page 2 of part 3. Grant Cardone: I hate the homeless situation and you wonder – what happened to this guy? Something changed in this guy’s life and he just couldn’t turn it around and the situation worsened to the point of being homeless. And what about all the people that have a home and are homeless, and the married people that are not really married because something happened and they just couldn’t or wouldn’t do what was necessary to turn it around. What about those with jobs that go to work every day, hate their job, dislike the people, their co-workers? They have income from the job but not really a job! You know, you’ve got 10 percent unemployment in the country today, and while it’s easy to feel for the people unemployed, these people lost their jobs for a reason. This is the confusion that’s going on in the market place today. Unemployment is not just a statistic, it is a massive wake up call. You know, any body can be homeless, any body can be without work, anyone can lose a marriage if they don’t continue to create on the future of whatever it is they want. If you don’t keep creating your job, your home, your marriage, it will cease to exist. I was fired from the last job I had on six different occasions. Grant Cardone: Six times from the same job, but I never left! I kept saying, O.K. yeah, yeah, I got it. I got, and I just went out and produced more! I continued to create even after I was fired. And my creating led to production. And production gets you protection. Grant Cardone: They could not afford to get rid of me, it didn’t matter how much trouble I was, or how much I caused, I produced more than I cost the company. And the people that are losing their jobs today, I know they’re going to protest this, and say, Oh, Cardone, he’s obnoxious, but the reality is your job ended because you didn’t produce enough. If you’re whole industry was wiped out, it failed because the people in that industry didn’t produce enough. You know, people don’t buy the little buggy whips any more, because the automobile industry wiped out the horse and buggy. And those people are like, oh, woe is me, I’m out of work! Like the homeless, oh, woe is me, I’m out of work, or I’m out of a home. Look, you’ve got to create in order to have what you want! The market place punishes anyone that does not continue to create a future. Now, the problem, a big problem today, and this is going to get us in a whole other area, is the government keeps subsidizing the people that don’t do any thing. And as long as you do that, why would I get a job?! I mean, you’re going to give me 32 weeks, all paid for, and not even alert me to the potential cost of being unemployed for that length of time with some type of warning?! There should be a warning label on unemployment benefits. Warning: After 32 weeks, you’ll be of no value to any one in the market place! Like, prescription drugs have a warning, like you know, if you take this pill it may or may not solve your problem but there is a chance you’re eyes will bleed. Grant Cardone: But, look, if you take 32 weeks of unemployment, in today’s economy, you will never be worth any thing in the market place again, and that warning should be given by the government. Because I’m not gonna’ hire ya’. And, this brings us in to the employment issue, which is a very passionate issue I have right now, which is how to get a job, what it takes to get a job, and, people are still hiring jobs. You just don’t see it on T.V. They don’t report how many new jobs are given, how many new people are employed. I don’t know if I have an answer to your unemployment issue, but I promise I have an answer to staying employed, staying busy, and making sure you’re never homeless. Grant Cardone: No, I don’t believe that, I think the government doesn’t know how to run a business. I think they’re too busy trying to satisfy voters rather than actually make a difference. 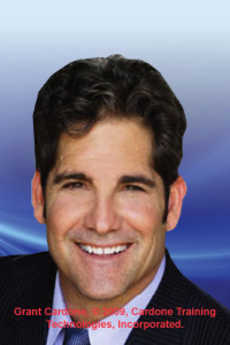 Don’t miss our continued exclusive interview, in part 4 with Grant Cardone, in our next issue, as Grant discusses with us what happened when he approached the U.S. government about his solution to solving the foreclosure crisis and today’s economy, foreign money, what actors and models need to do to succeed, and much more! If you do not yet have the book that will transform your business life and career, ‘Sell to Survive,’ get it now. To book Mr. Cardone for a speaking engagement or television appearance, contact management at www.starpowermanagementllc.com or call 310-226-7176.